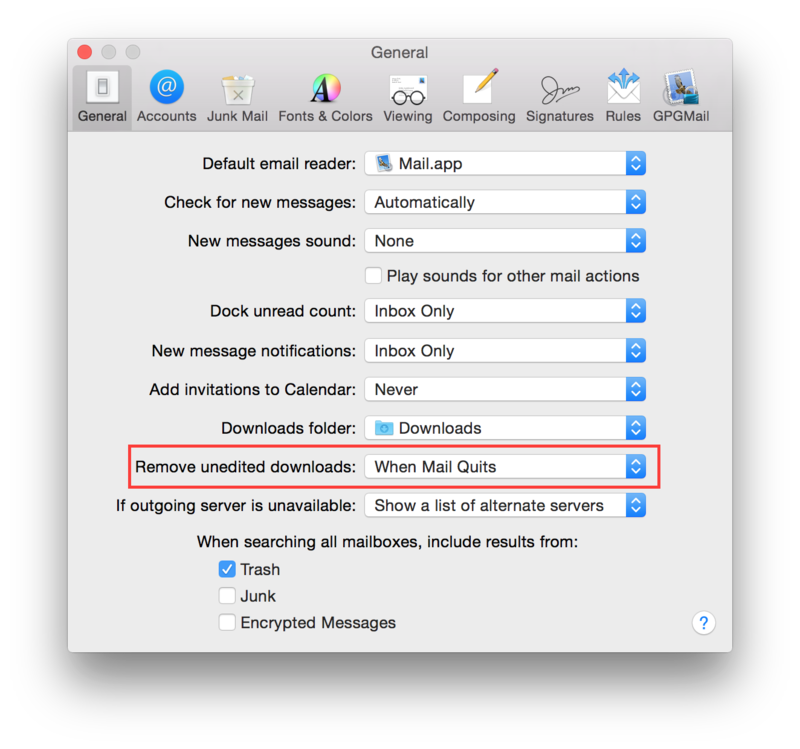 Apple Mail is a mail client application shipped by default with Max OS X. This chapter is dedicated to configuring Apple Mail version 9.x. It comes by default with Mac OS X 10.11 (El Capitan). 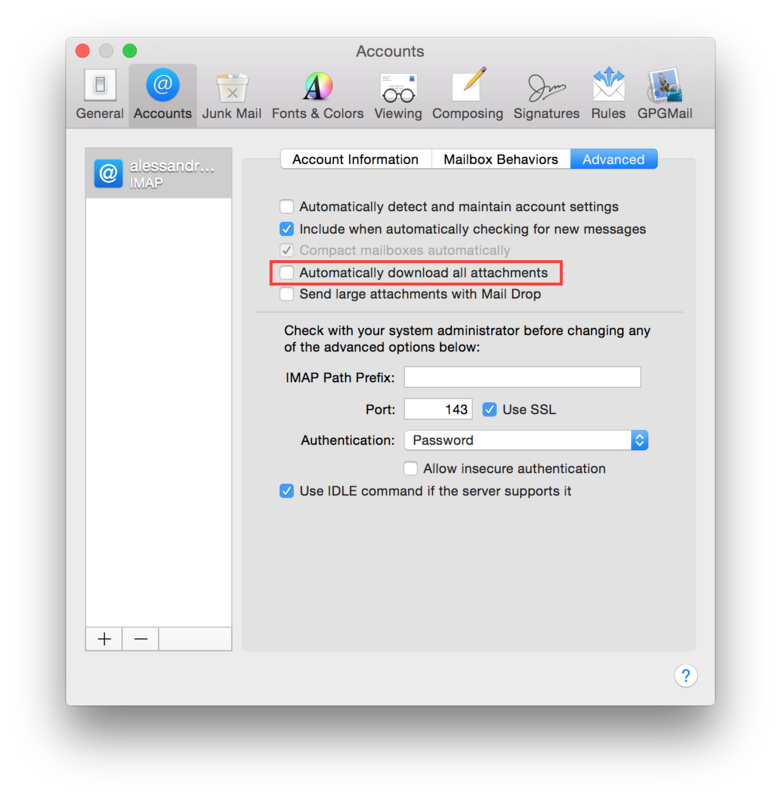 If this options is enabled Mail automatically manage settings for your email account in Mail, such as port numbers and authentication methods. It is not suggested to not leave Mail the control over so critical settings and disable this option. Uncheck “Automatically detect and maintain account settings”. If this options is enabled Mail automatically downloads all attachments for your email account in Mail. It is suggested to keep the control over what is downloaded so disable this option, automatically download attacchments is pretty dangerous, just think to someone sending you an email with an image on a controlled server, he could be able to track your IP address. Uncheck “Automatically download all attachments”. 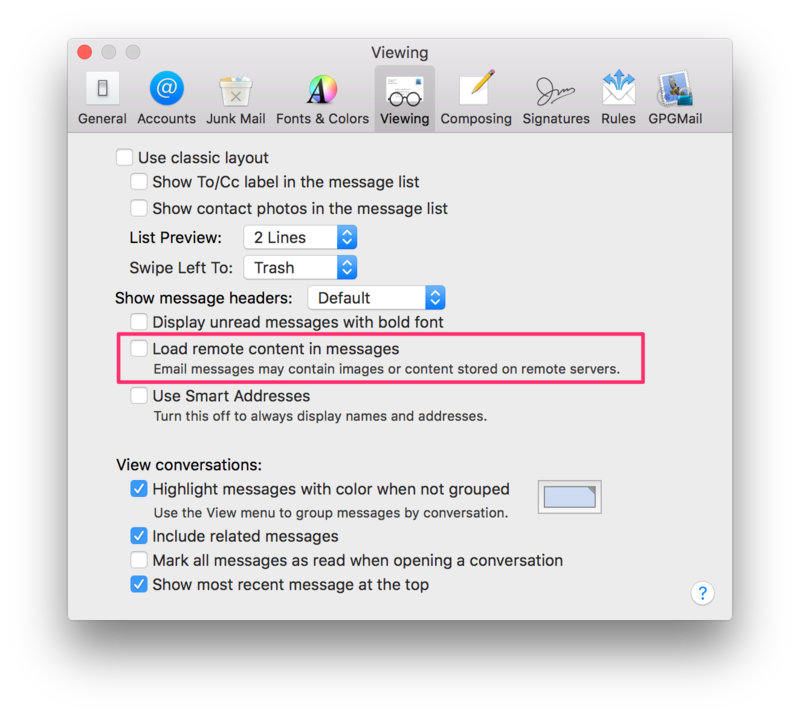 Mail defaults to automatically load any images, styles etc, that are included in any email, regardless of sender. Not only can this be an attack-vector, but it’s also commonly used for tracking, leading to loss of privacy. Don’t worry about disabling the automatic loading though, you’ll still be able to load remote images and stylesheets for any mail with a single click. Uncheck “Load remote content in messages”. If you want to definitely block any connections it is suggested to configure a firewall, i.e. Little Snitch, and permit connections starting from Mail.app only to your mail server. MailDrop is a new feature is Yosemite which allows you to deliver large size attachment, they are uploaded to Apple Cloud and then fetched by your recipients. This is a great feature but it needs to disclose your file to Apple Cloud. It is suggested to disable this feature and use other technolgy under your full control to transfer big files. Uncheck “Send large attachments with Mail Drop”. Apple Mail has the feature to automatically add invitations to your calendar. It is suggested to not allow Apple Mail to automatically parse invitations and launch an external application to avoid possible future exploitation with a new vulnerability. Set “Add invitations to Calendar” to “Never”. If you open an attachment in Apple Mail, it stores the file in your disk, inside your attachment download folder, and by default leaves it forever. It is not suggested to leave mail attachements on disk, because they can be some kind of untrusted files. Set “Remove unedited downloads” to “When Mail Quits”. Classic mail protocols like SMTP, POP and IMAPS are plain text protocol without any encryption, it means your data and credentials are send in plain text. It is suggested to use only encrypted protocols. Ask your email provider for encrypted email protocols support and configure your mail account properly. GPG is a software to encrypt, decrypt, sign and verify files or messages. It is widely used and its adoption is suggested to protect your privacy. GPGTools is a suite designed to bring GPG on Mac OS X and add encryption to Apple Mail. It is suggested to download and install GPGTools.